April is the cruelest month, T.S. Eliot assures us, but March can be pretty lousy, too. I feel April's pain on the fifteenth each year, but I spend laborious hours all March assembling the information for my tax accountant to deliver his terrible news. I realize this falls into the category of First World Problems--and that if I only kept up with my Quicken entries all year long it'd be a snap to do--but hey, I have a lot on my hands. Books to read, books to write, clothes to wash and children to send off to college. And then there's the loss of people I love. That seems to happen with brutal frequency in the month of March. My mother, for example, died on the fifteenth--the Ides of March--and so did my uncle, several years before her. It is a date rife with foreboding for me as well as Caesar. Hence today's Meditation, which purports to be about Death and Taxes. I confess right now that the title is a bait and switch--I intend to talk solely about Death. I lost a good friend a few weeks ago. I will call her simply My Friend, out of respect for her privacy and that of her family. Hers was a death foretold--whose, really is not?--but it crept up on all of us who loved her. A bout of indigestion at a July 4th barbecue, diagnosed twelve hours later as Stage 3 pancreatic cancer. She lived eight months after Independence Day and spent most of it exploring what she called "a better dying." As she had taught all of us for years how to live a better life, I wanted to learn from her in this as in everything. But the apprenticeship came to end early one Saturday morning. Yesterday, hundreds of us gathered in an intimate and lovely old Episcopalian church to weep as a soprano sang "Swing Low, Sweet Chariot." Bear with me. I need to tell you about My Friend. It will help me come to terms, a little, with her absence, and perhaps a little with my own life. It may even help you to come to terms with yours. She wrote poetry her whole life long as a way of processing the oddities and emotions and gifts of life; she embraced everyone she met; and never did I hear her say a negative thing about another human being. Her novel, unpublished, is a work of art. And now my bitter confession: I wasted the time I had with her. Being a busy person, as she was herself, I found many reasons to put off our meetings. I would think in my mind: I must see My Friend again soon. I must walk the dog with her. Drop her a note. Push open her picket fence gate and walk up her stone steps to sit on her vine-covered porch and talk a while. I never did it enough, and now I can never do it enough again. In the months following her diagnosis, we struggled against the inevitable and our own inability to change the outcome. We traded spurious good news and clutched at straws. When you feel powerless, you look around for something to do. Another friend organized a cooking schedule. We all signed up. In the months remaining to My Friend's life, I needed this more than anything--the dates on the calendar that said I could spend the day in my kitchen, making soup. Making dinner for My Friend's family. Of course she was a marvelous cook herself and a great gatherer of love around her table, and so dropping containers of steaming pasta and polenta and curry and beef ragu on that front porch was all each of us who loved her could do to feel better about ourselves. Less lonely. Less out of time. Ten days before she died, My Friend sent us all Valentines that she and her husband had hand-drawn and written to each other, with phrases of her most beloved poet, Walt Whitman. Then with the knowledge of death as walking on one side of me, And the thought of death close-walking the other side of me, And I in the middle as with companions, and as holding the hands of companions, I fled forth to the hiding receiving night that talks not. When she was truly gone, those of us she left behind appeared out of the woodwork to help her daughter, who is in large measure My Friend still walking on this Earth, to move tables in from the brick terrace that was waking in Spring, from the porch where she will never sit again, now, propped up by those cushions with words. We scrubbed the tables and moved chairs and swept floors and threw open french doors to sunlight and March wind. We held her dog close when he whined. We arranged flowers. 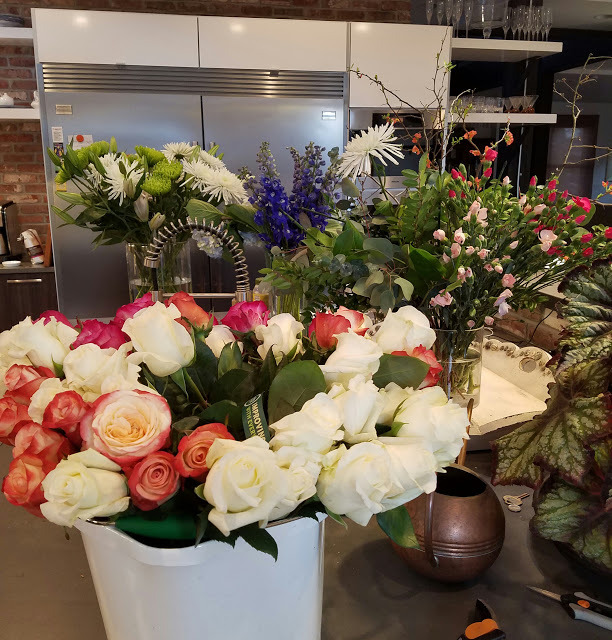 It was necessary to me in particular to buy a lot of flowers (see picture at the head of this post, from my kitchen a few days ago), and leave them in bowls scattered around the house. So that when everyone assembled to love all that remains of My Friend, the Garden was there, too. I have tried to absorb the lessons of A Better Dying these past few days as I have walked on from My Friend's picket gate and the people she has left at the foot of Marvell's tree. In order to have A Better Dying, I need to live a Better Life. Be curious and embracing of everyone I meet. Take time to measure and cut, as things ought to be measured and cut. Be drunk on words. Serve love every night and morning at my table, even if I'm the only one eating there. I leave you with one of My Friend's final poems. stones that have stuck in where they were thrown. to my beloveds--those days when we beheld each other on the turning world. FRancine, a lovely memory of your friend. This last month, I also lost a friend ten years younger than me to breast cancer and an aunt, 35 years older. Both hit hard. May your Friend's memory be a blessing, and may all who loved her find peace. Oh, Francine, what a most thoughtful and lovely tribute to your friend. You showed how she was a great writer and you mentioned that her novel is unpublished. I wonder if her family would want it submitted for possible publication? Wouldn't that also be a wonderful tribute if it worked out? Finally your great piece reminded me of something my father used to say, "Treat your friends as if you will die tomorrow....treat your finances as if you will live forever." Thanks for a great post! I agree, Karna, it would be wonderful if her book were published. We'll see what happens. Sandy, so sorry to hear you're grieving. Take care. This post made me cry, and it made me smile. Like the perfect movie, this is the perfect tribute to a friend you clearly loved. I'm so sorry you lost your friend, and so happy that you paid her tribute here. Thank you, and hugs. "At the center of our being is a point of nothingness which is untouched by sin and by illusion, a point of pure truth, a point or spark which belongs entirely to God, which is never at our disposal, from which God disposes our lives, which is inaccessible to the fantasies of our own mind or the brutalities of our own will. This little point of nothingness and of absolute poverty is the pure glory of God in us… It is like a pure diamond, blazing with the invisible light of heaven. It is in everybody, and if we could see it we would see these billions of points of light coming together in the face and blaze of a sun that would make all the darkness and cruelty of life vanish completely…I have no program for this seeing. It is only given. But the gate of heaven is everywhere." August is my month of deaths, when the heat and thunderstorms seem to beat me down, but the sun always shines again. What an incredible essay, Francine, so rich with love and longing and loss. I've recently been reliving my sister's death some 50 years ago, and your essay has helped me. Bless you. Never have I read a blog post until now when a huge lump in my throat resulted. There are lessons for us all in your words. We must not be too timid or busy to pay heed. I am sorry for your great loss but thank you for sharing your devotion and sorrow. I have shamelessly posted both your fleurs picture and your essay as my Facebook profile. Shameless because I want to read more of her words, and I did not ask for your permission. Oh, to be remembered like that. Thank you for all the kind words on My Friend's behalf. I wish I could respond to each individual comment, but this blog program doesn't allow that except on mobile phone apps--and it's too tedious to type on a phone! I appreciate the inspiration of the Merton. The gate of heaven is everywhere, particularly in words and gardens. Debi, hold your friend close. Gayle, hold your sister's memory. Happy spring. It does spring eternal. Francine, for you, a woman so eloquent and easy with verse, to admire your friend's life of words... she must have been extraordinary. I'm sorry for your loss, and I'm sending you love. I feel compelled to clarify for all the readers of this post: This is not MY loss. This is a loss to the world of one particularly compelling person. MY loss was in not spending enough time with her while she was well. That's the lesson I've been struggling with--and hoped to convey: That even though I know we all die, I persist in acting as though my time with those I care about is infinite. It's not. So go forth and spend an hour with someone you value today! Live this moment.